The CA portal is an online platform to make your professional website for CA CS and LAWYERS easy and affordable. 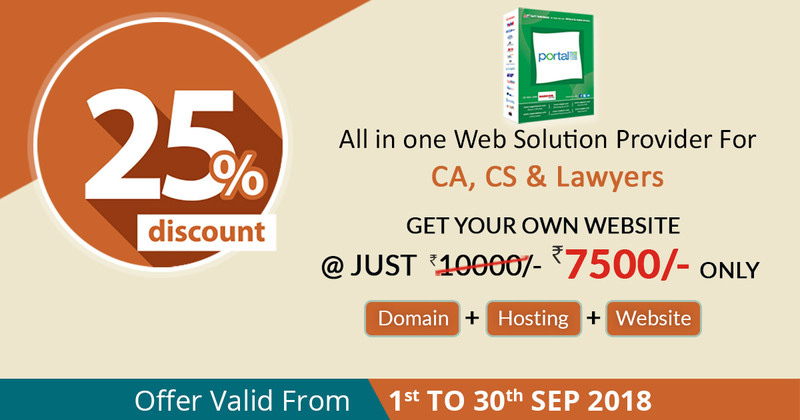 Now Get your own professional website at flat 50% discount only on CA Portal. 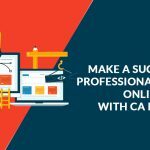 On the ocassion of CA Day, CA Portal offers all the CA, CS and lawyers, a chance to build their own website at an affordable price. 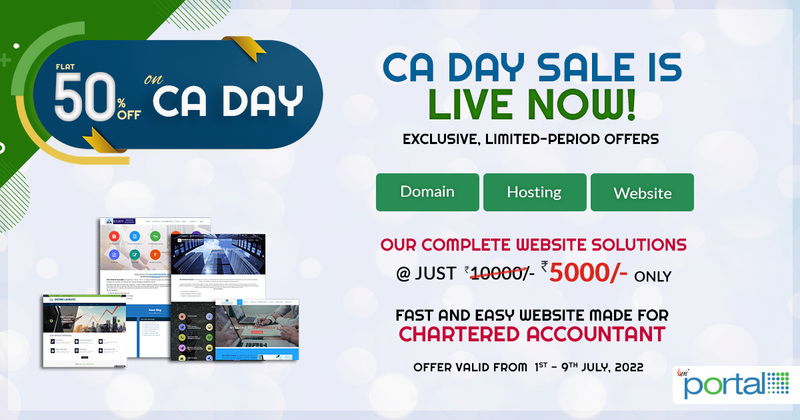 CA Portal is a complete package for the tax professionals including (Domain+Hosting+Website) on flat 50% discount from 1st to 6th July 2018 to celebrate the Chartered Accountants Day. CA portal can be termed as a complete online solution for CA, CS & Lawyers websites. The portal manages complete record of the clients with a fresh portfolio of the CA professional on the website itself. We follow strict guidelines of the designated ICAI/ICSI/Bar Council association to construct the online platform for the clients. 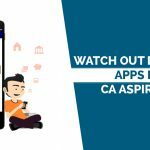 CA portal provides 100+ themes/templates to choose from including all the details of professionals. The layouts are managed according to the user interface for the best possible outcome of details and clients related information. Also, the templates are well managed with proper links. We also offer independent domain names as per your wish. This feature helps the clients to become distinguished from their other competitors. Having a domain with your own firm name also helps in increasing repo of the business and personal goodwill while having interaction with clients. (Independent domain name is subjected to availability). 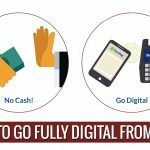 The clients will be provided with the separate login panel for individual account maintenance. We also offers website hosting with complete management of the website and its content. We proudly assist our clients with all-around technical support from expert technical staff. The notification is an added feature of CA portal We provide all the latest notification and circular announcement regarding GST tax rates, company law notifications and also announcements regarding TDS. Please note that the offer (50% Discount on SAG Infotech Software on CA Day) will be only valid from 2nd to 6th July 2018. Kindly contact as soon as possible for the quick registration process.